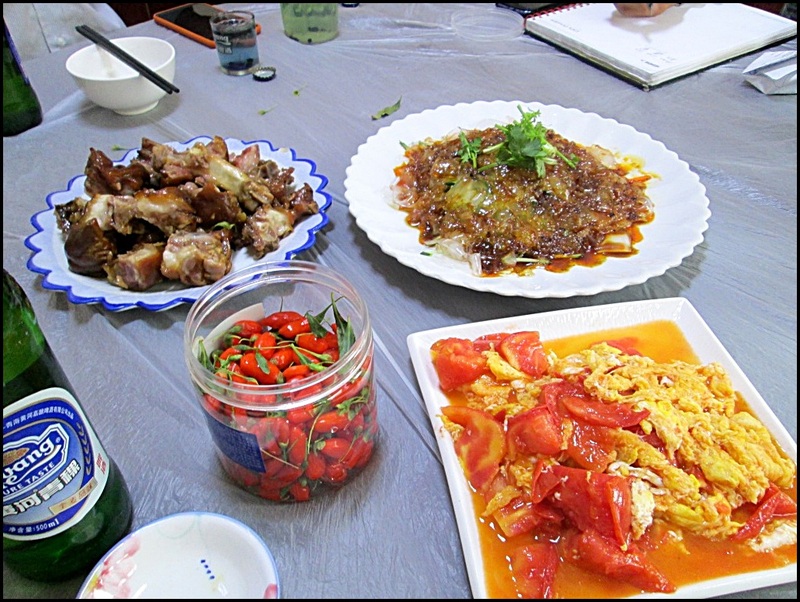 We love the food in China. We really do. After enduring months on end of bland grub and unidentifiable meats in Central Asia we are absolutely relishing the taste sensations here. 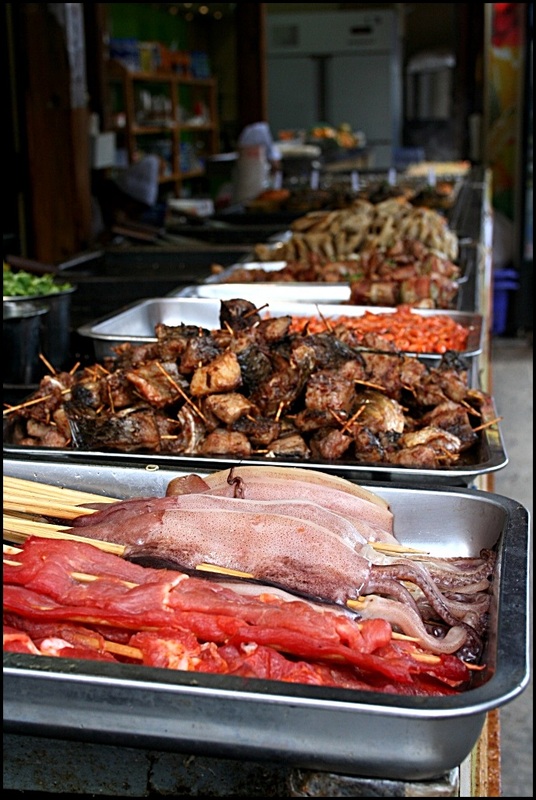 Everything is fresh caught, slaughtered or picked, cooked to perfection, flavoursome, colourful and totally delectable. And, much to my surprise, there doesn’t seem to be much rampant use of MSG in restaurants at all. Supermarkets are a different story. Grocery shopping here is insanely interesting and I’ve wasted many hours simply meandering around aisles upon aisles of preserved vegetables, meats and even boiled eggs…all vacuum packed and with an expiry date of 3 years. I’m no nutritional scientist, granted, but I could not think of a single thing which could possibly make a boiled egg be still edible after 3 years. Hmmm…must do more research on McDonalds for that one I guess. Anyway, as much as we do love the food in China, I have had trouble digesting bowls of fried garlic and chilly noodles for breakfast. I’m not sure if it’s fried garlic at 7am that disagrees with my very Mediterranean stomach, or the fact that one must wash down the whole lot with a cup of piping hot orange juice. Either way, I have suffered a few gastro-cultural clashes in the last month and a half. Travel far and wide around this amazing planet of ours and you’ll find quite a few countries which have an uncanny way of reminding you of whence you originate. Think you’re a citizen of the world with no particular affinity for your or any other western country? Come to China! Your cultural and ethnic roots will be shoved in your face several times a day. Today, I am quite convinced that the famed quote “foreign countries are not designed to make you comfortable, they are designed to make their own people comfortable” must’ve been coined by a European eating out in a restaurant in China. As a westerner, I find it slightly nauseating when locals spit and throw food on the floor, yet I’m utterly amused to see that no-one ever blows their nose in public. This is the big no-no here! I’m also quite happy when I spot a long line of stray dogs waiting to enter a restaurant. Not only are they treated better than my misconceived prejudices ever led me to believe, but they are allowed to wander in and out of restaurants, vacuuming the floor as they pass. My country’s Health and Safety Board would have a field day here! This is one of the most bizarre, confronting and foreign cultures I have ever had the pleasure to encounter, and if you think I am not enjoying every moment of it, think again. I love being blown out of my comfort zone and am finding the whole experience utterly revitalising. For me, this is what travel is all about, and to be completely honest, something I haven’t felt in years. Not since Chris and I got stuck in a tiny Sudanese village for two weeks back in 2009, have I felt so far away from home. This, l above all else, is what gets my juices flowing. The Chinese are a loud lot, it must be said. They make Italians seem like demure Germans in comparison. They talk, laugh and argue as if the world is coming to an end. They also have an incredibly strong family bond to an extent, I have been told, that is incomprehensible to most Westerns. Oh…and they’re absolutely obsessed with food! They seem to eat all day long, order more than they could ever consume and love sharing their delights with us. Although we usually opt for restaurants whose menus items are complemented by pictures, sometimes we have no option but to walk into a faceless, menu-less and (unfortunately) picture-less joint. It matters not. Soon enough, the chef-du-jour will drag me into the kitchen, proudly show off his daily produce supply and ask me to point. So I point at mushrooms, tomatoes, eggs, spinach and slab of meat…and then return anxiously to our table. Within 10 minutes, three or four large platters arrive, steaming hot and smelling like heaven. Garlic, ginger, coriander, basil, chilly, lemongrass, paprika…all used in abundance and in perfect unison with the main ingredients. 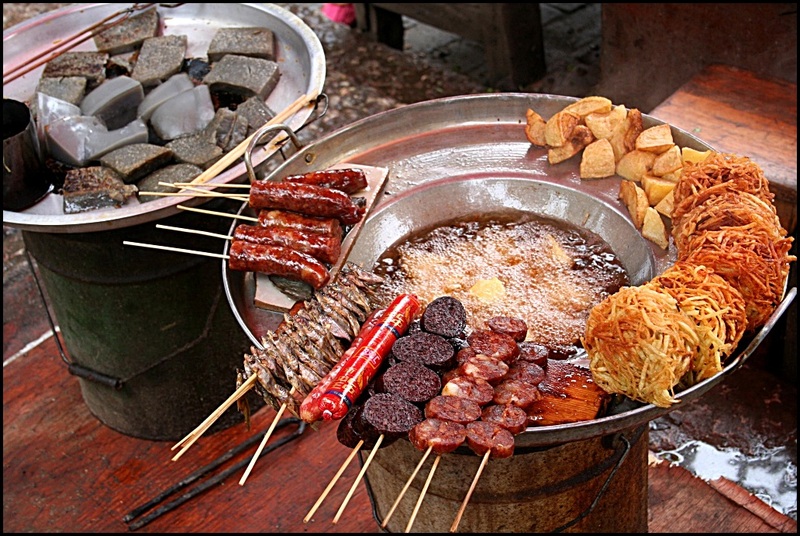 China is a gastronomic haven bar none. 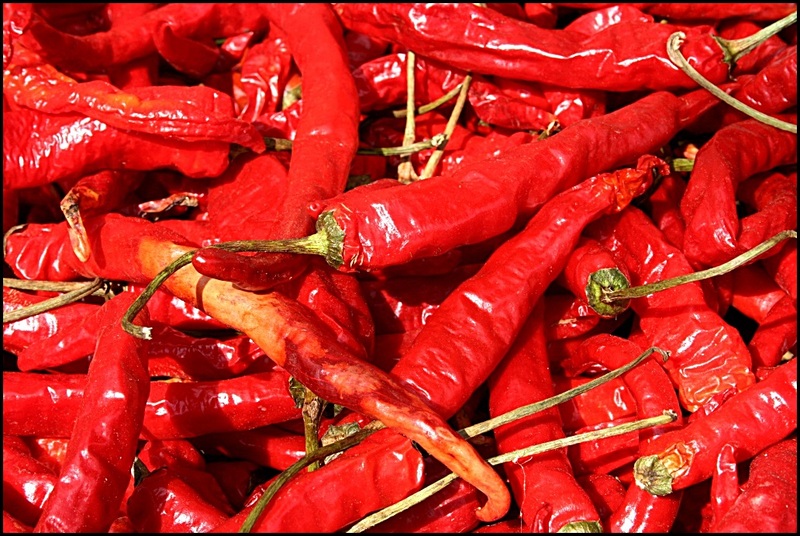 Mouth-numbing chillies…the condiment of choice! 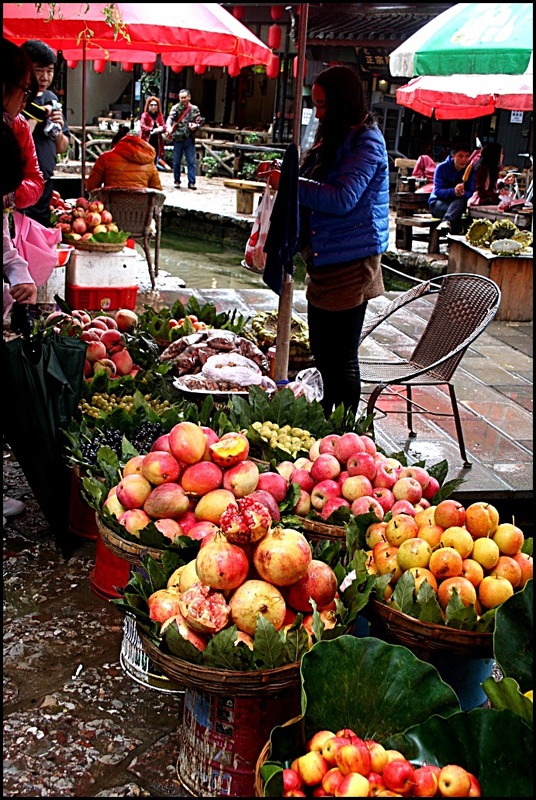 In the fertile valleys of Yunnan province, fruit & vegies have been out of this world! Recently I have also adopted a new strategy, which seems to work wonders. Walking into a bustling restaurant one night, and finding the kitchen far too busy for a visit, I took the waitress by the hand and walked around all the tables studying other patrons’ dishes. By the time I had selected the first dish I wanted to order, all eyes and smiling faces were on us. So I simply cheered a communal ‘nihao!’ to the table I honed in on, pointed to a plate of steaming chicken and peppers, smiled at the waitress and gave her the thumbs up. Everyone roared with laughter and, within a minute or so, patrons all over the restaurant were holding up their plates of goodies so I could have a better look. It was insanely fun!!! 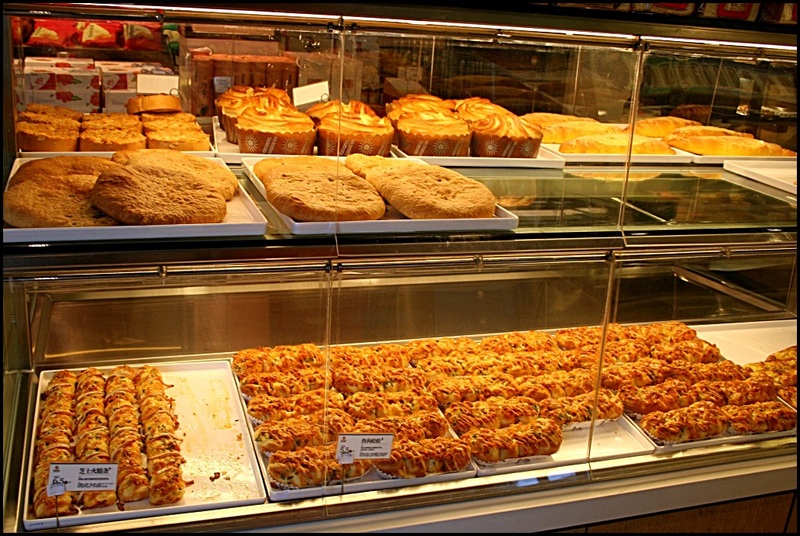 Although the Chinese seem to make little distinction between breakfast foods and all other-times-of-day-food, they do consume a lot of sugar in the shape of cakes, biscuits and sweet breads; so at least we are able to buy some croissant-type treats to have with coffee in the morning. Luckily, because eating out is just so cheap here (cheaper than cooking at home, or in a tent) we tend to eat out every day rather than cook on our stove. The options, for the latter, are rather limited. Here, it’s either noodles, noodles or noodles. Although there are plenty of condiments to change the flavour somewhat (peanut butter for satay etc) it can get a tad tiring. I still can’t bring myself to try a 3 year old boiled egg. Our young chef whips up some yumminesses! It should be noted, however, that for the first month in the country, we were about as far away from any known foreign tourist trail as could be. 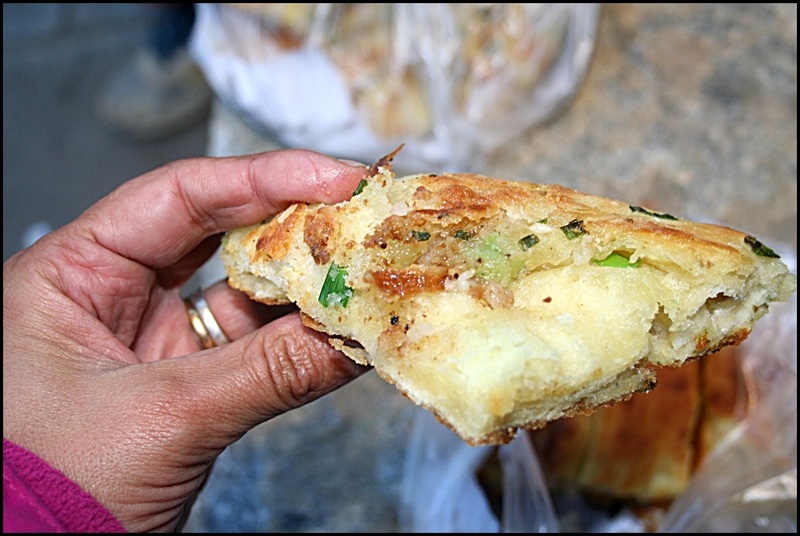 Today, sitting in the courtyard of the very delightful Jade Emu Hostel in Dali (a joint run by an Australian/Chinese couple) and enjoying a very delicious egg and bacon baguette, I fear that the fun days of ‘What the heck is in that?’ exclamations may be a thing of the past. 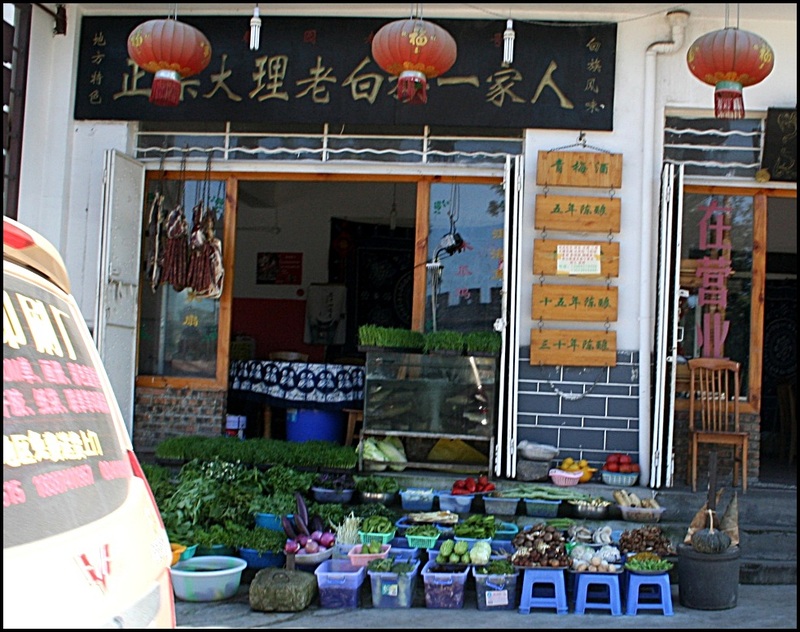 Every restaurant has English menus and offers Western food, every second person speaks English and, although we are still stopped occasionally for ‘photos with locals’, the attention is minimal compared of what we’ve experienced up until Dali. In the past month, we’ve had a 20-strong crowd squeeze into a hole-in-wall eatery just to watch us eat with chopsticks and shop owners giving us bags full of fruit, vegetable and biscuits at no charge in small villages. We’ve been invited to lunches and dinners by locals we just met in the lobby our hotel and been completely surrounded by curious people during a short tea break in some nondescript town. 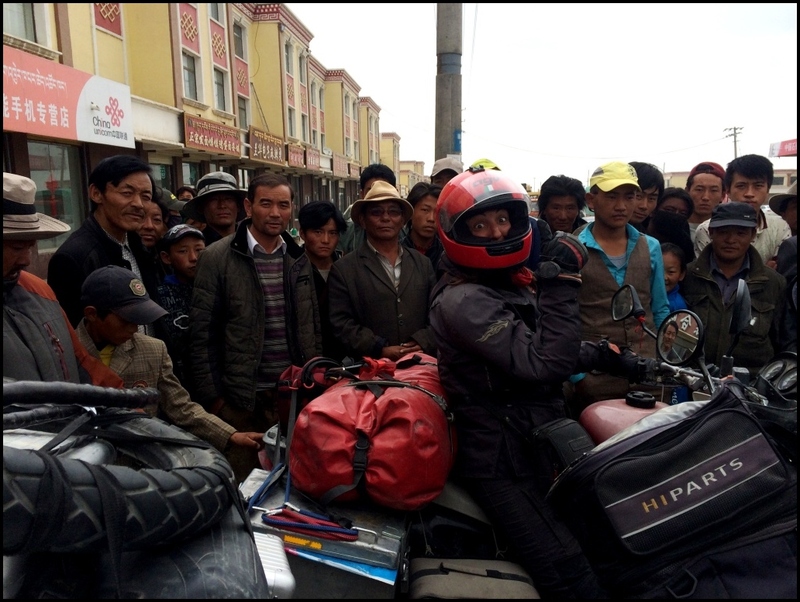 Being mobbed by highland Tibetans was a daily occurrence. We soon learnt to eat very fast. Lovely businessmen we met in the lobby of our hotel who took us out to dinner..
All of this, of course, is very much a case of ying and yang. The attention can get a bit too much, as can the lack of personal space, although this has been an issue primarily in the High Tibetan Plateau. It’s also fantastic, I must admit, to have some ‘home’ food after 6 weeks in the country. Steaks, burgers, home-made pasta and wood-fired pizzas…that’s what we have to enjoy for a few days. I finally found a brekkie item that was not fried in garlic. Yummy! China has been, for us, a wonderland of delights in every sense and one which we won’t forget in a hurry. 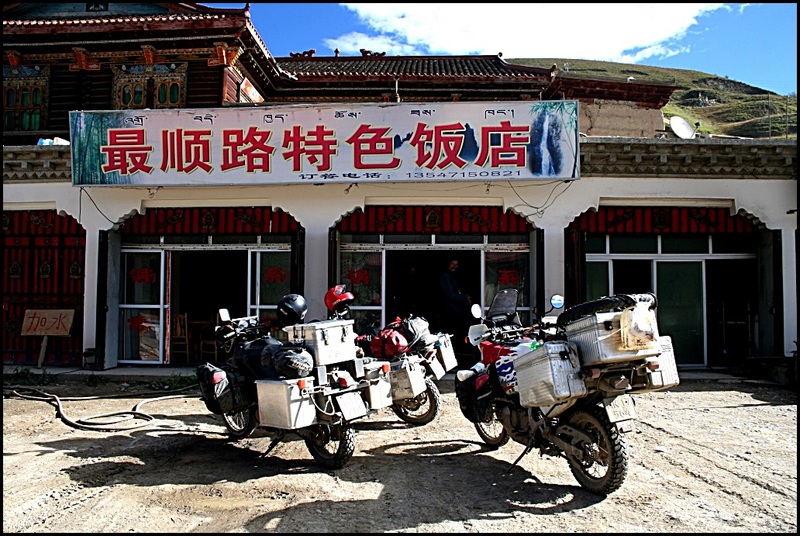 This entry was posted in Overlanding and tagged adventure, adventure travel, appreciation, BMW F650, China, Chinese food, discovery, explore, gastronomic journey, long-term travel, motorbike trip, MSG, overlanding, world trip. Bookmark the permalink. Sounds like your Chinese adventure is much more enjoyable than our one. We live near Ashfield, and really don’t like Chinese food, even though we’ve been to the best restaurants in Ashfield. Just not our bag. 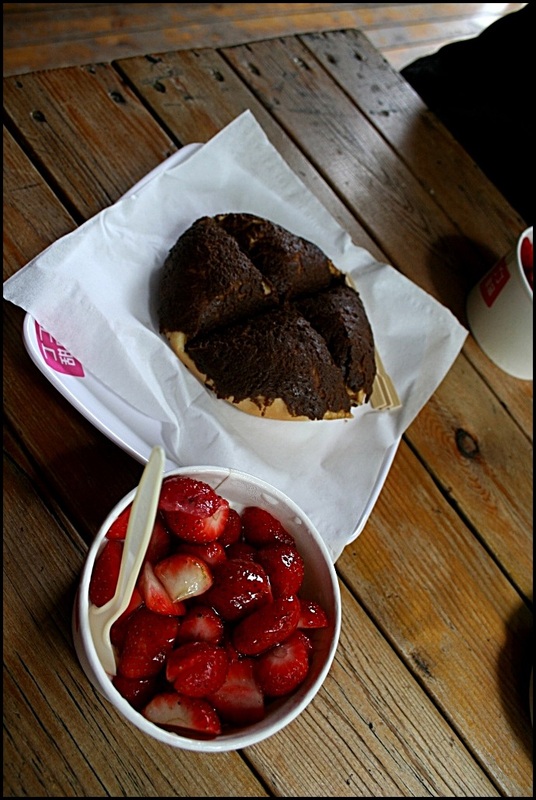 But reading your blog and seeing the photos, we’re clearly not as adventurous food-wise as you. In Beijing in June this year we ended up eating Indian and pizza cos we just weren’t a fan of the greasy food we encountered. Maybe we should travel with you two next time! Your writing is still awesome and loving the blogs. What’s your ETA for Sydney? 2023? Relativity is really a very interesting thing. Perhaps we enjoyed it immensely because we had endured Central Asian food, which wasn’t just bland, but overly-oily. Everything there is cooked in mutton fat. had we come up from Laos, Cambodia etc, we may have had a completely different perception. Oh who knows? we loved it for whatever reason!!! 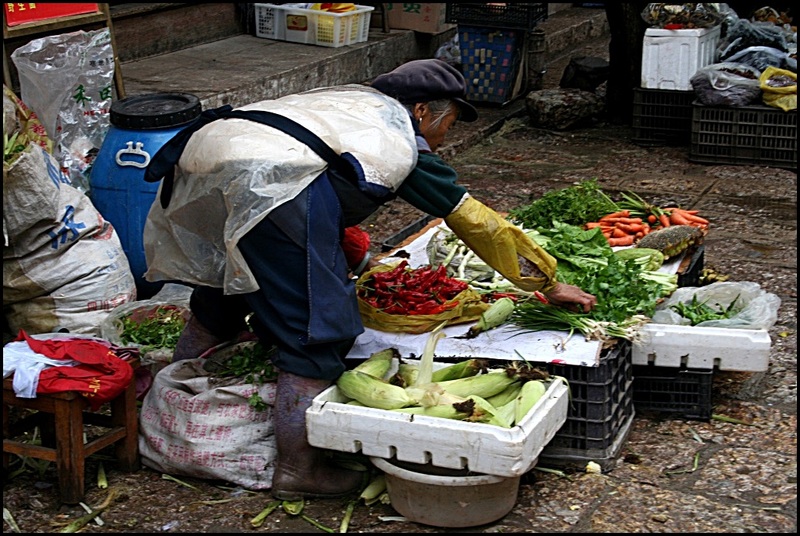 as an Aussie living and working in China for most of the past 7 yrs (I went home between April 2012 to Feb 2014 with my Chinese partner) I have really enjoyed reading your blog and can relate to it heaps. I am curious if you met Mr Dong in Xining? He was in partnership with Ricard for some time. I have just had the pleasure of taking a couple of Aussie friends for a ride from Henan province out to Gansu for a months ride. About 4000km’s and many interesting spots. A highlight was finally making it to Xining and meeting up with Mr Dong after meeting him 5 yrs ago and just phone contact until now. 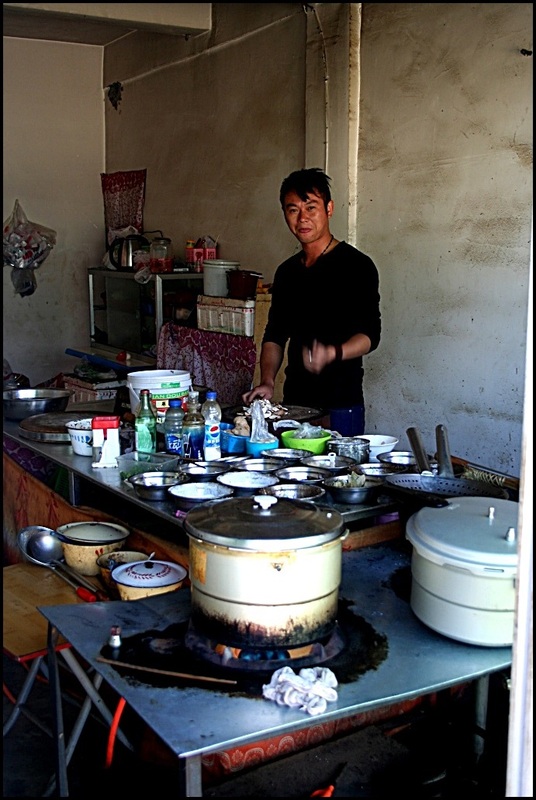 Great guy, him and a few of his friends showed us a great time in Xining and around Qinghai lake. Also curious as to where you are originally from? Travel safe and best regards from China. Ken. Lovely to wake up to all your message this morning :)) so happy to hear you’ve been enjoying a good read. No, we did not meet Mr Dong in Xining, we were there​ with Helen, who is also working with Ricardo. Such lovely people in China, we had an absolute blast. Helen actually put us in contact with a friend of hers in Dali, who took us out on a great ride day with his mates. We had a fab time. Loved China to bits!! I was born and bred in Italy! 😀 Migrated to Australia (Sydney) with my family back in 1986 when I was 13. Feel like a mush of nationalities most of the​ time, as you no doubt​ would understand. When one travels or lives elsewhere for a long period of time, one tends to pick up habits or ways of thinking that are a little mixed. Where are you based in China? And Australia? All the best from Malaysia! Lets get serious, I really enjoy your Blog and specially the Informations about travelling by bike through China are really useful for me, cause I am planning on a trip through China for the beginning of next year. Entering from Laos and than either to Mongolia (that was my first Idea Plan A) or maybe along the Silkroad, pretty much like the way you took. Hi Simon! How are your China crossing plans for this year looking? I’d love some up-to-date info on the region. Are you having fun?? One of the best meals I’ve ever had was a bowl of beef noodle soup. It was in a hole-in-the-wall restaurant near the Forbidden Palace in Beijing. I ordered by cruising the tiny restaurant and then pointing and doing a charade of ‘I’ll have what he’s having’. When we were Beijing last year, we walked back to that same restaurant to find all the equipment being carried out. What a loss.